What we’re thinking about as we grow - ethics, oversight, and getting things done 2017-10-19 Andrew Critch Berkeley Existential Risk Initiative Berkeley Existential Risk Initiative Berkeley Existential Risk Initiative Donee periodic update AI safety/other global catastrophic risks Outlines BERI's approach to growth and "ethics" (transparency, oversight, trust, etc.). 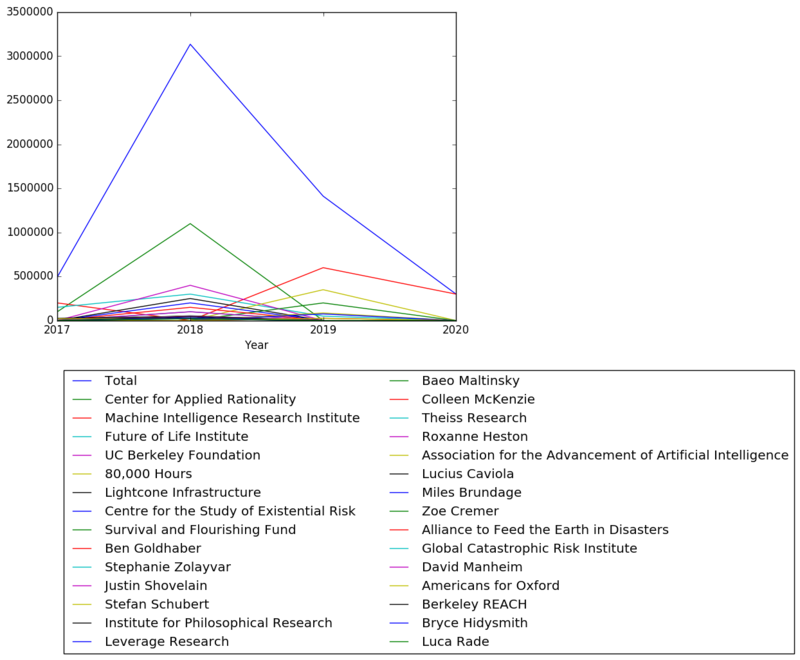 BERI's semi-annual report, August 2017-09-12 Rebecca Raible Berkeley Existential Risk Initiative Berkeley Existential Risk Initiative Berkeley Existential Risk Initiative Donee periodic update AI safety/other global catastrophic risks A blog post announcing BERI's semi-annual report. Sebastian Farquhar 12,000.00 31 2018-10-31 AI safety https://web.archive.org/web/20181107040049/http://existence.org/grants-list/ -- “to attend conferences and purchase compute for experiments related to his PhD research on uncertainty modeling in neural networks”. 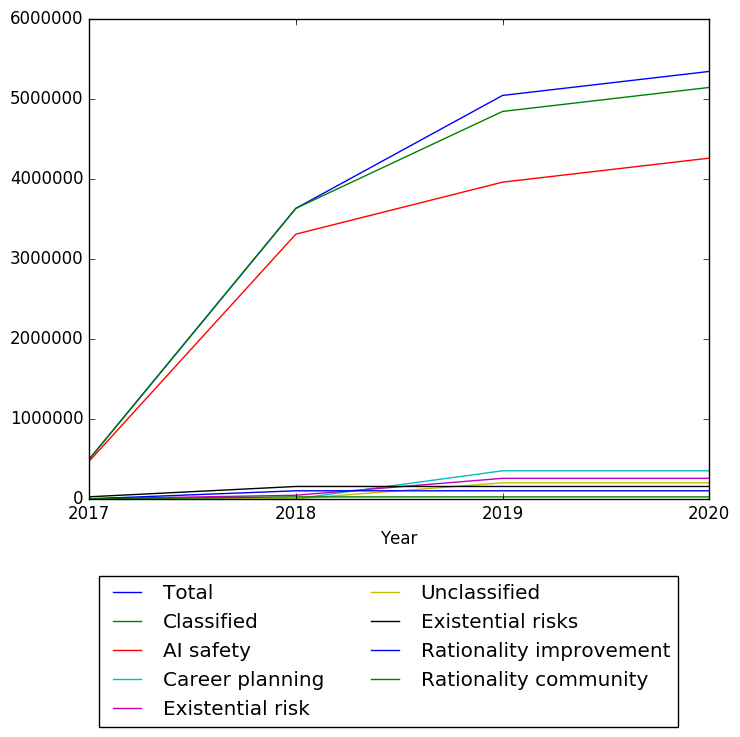 Justin Shovelain 100,000.00 8 2018-10-24 Existential risks https://web.archive.org/web/20181107040049/http://existence.org/grants-list/ -- “to lead and develop Convergence Analysis, a new group focused on x-risk strategy research”. Berkeley REACH (Earmark: Sarah Spikes) 24,000.00 26 2018-10-23 Rationality community https://web.archive.org/web/20181107040049/http://existence.org/grants-list/ -- “to implement improvements in support of the Rationality and Effective Altruism Community Hub (REACH)”. Effective Altruism Sweden 4,000.00 35 2018-10-18 Existential risks https://web.archive.org/web/20181107040049/http://existence.org/grants-list/ -- “to support Markus Stoor’s project to coordinate two follow-up lunch-to-lunch meetings in Sweden for x-risk-focused individuals”. Association for the Advancement of Artificial Intelligence 20,000.00 29 2018-10-15 AI safety https://web.archive.org/web/20181019174535/http://existence.org/grants-list/ -- “for the support of the 2019 conference on AI, Ethics, and Society”. Jessica Taylor 10,000.00 32 2018-10-10 AI safety https://web.archive.org/web/20181019174535/http://existence.org/grants-list/ -- “to work on her research in AI alignment and other areas”. Ben Goldhaber 150,000.00 6 2018-10-10 AI safety https://web.archive.org/web/20181019174535/http://existence.org/grants-list/ -- “to support his project (co-lead by Jacob Lagerros) to bring x-risk-relevant questions to popular prediction platforms”. Stephanie Zolayvar 100,000.00 8 2018-10-09 AI safety https://web.archive.org/web/20181019174535/http://existence.org/grants-list/ -- “to train herself in circling and host circles for people who are promising contributors to reducing x-risk”. Roxanne Heston 49,532.00 20 2018-10-02 AI safety https://web.archive.org/web/20181019174535/http://existence.org/grants-list/ -- “to work on a variety of AI policy projects in Washington, D.C.”. 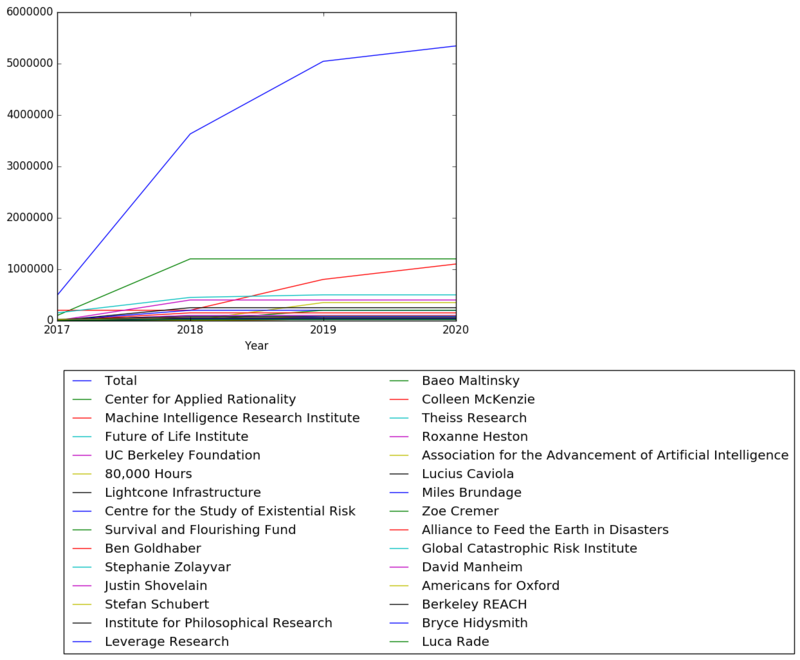 Baeo Maltinsky 55,000.00 15 2018-10-02 AI safety https://web.archive.org/web/20181019174535/http://existence.org/grants-list/ -- “to further his research on AI and technology trends”. Zoe Cremer 25,200.00 22 2018-10-02 AI safety https://web.archive.org/web/20181019174535/http://existence.org/grants-list/ -- “to support her as a visiting fellow at CFI, where she will research disagreements about the amount and kind of structure required for AGI”. Colleen McKenzie 51,000.00 16 2018-10-02 AI safety https://web.archive.org/web/20181019174535/http://existence.org/grants-list/ -- “to support her research on AI timelines and the processes that produce technical and scientific progress”. Cambridge in America 10,000.00 32 2018-10-02 AI safety https://web.archive.org/web/20181019174535/http://existence.org/grants-list/ -- “for the support of the Leverhulme Centre for the Future of Intellgience”. 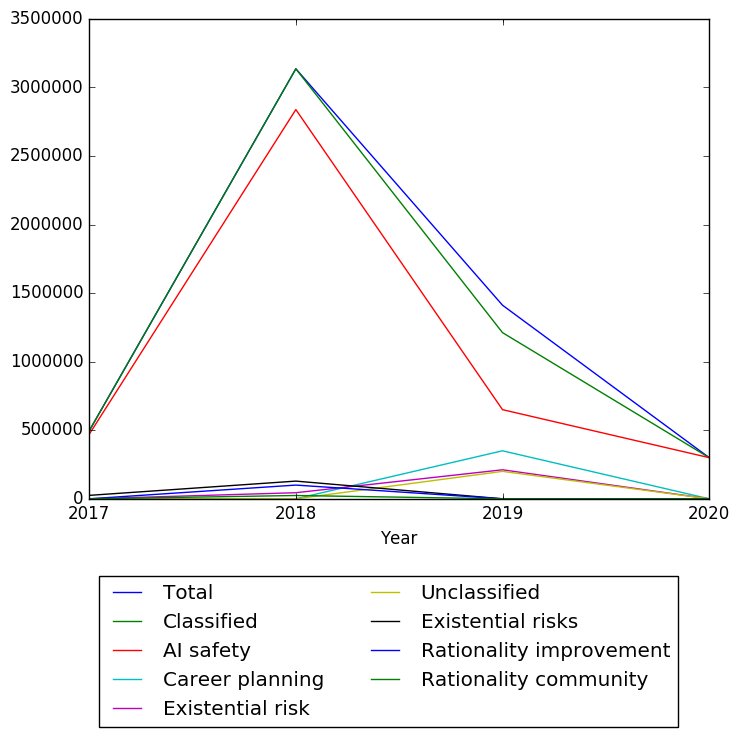 David Manheim 25,000.00 23 2018-09-26 AI safety https://web.archive.org/web/20181019174535/http://existence.org/grants-list/ -- “to research aspects of Goodhart’s law, focusing on multi-agent dynamics”. Probably related to https://arxiv.org/pdf/1803.04585.pdf. Luca Rade 20,400.00 28 2018-09-24 AI safety https://web.archive.org/web/20181019174535/http://existence.org/grants-list/ -- “to research the implications of coarse-graining by an agent in a complex environment for AI alignment”. Jordan Alexander 1,900.00 36 2018-09-24 AI safety https://web.archive.org/web/20181019174535/http://existence.org/grants-list/ -- “to host several meetings at Stanford EA and the Stanford Transhumanist Association”. Bryce Hidysmith 20,500.00 27 2018-09-24 AI safety https://web.archive.org/web/20181019174535/http://existence.org/grants-list/ -- “to analyze global risks from technology through a geopolitical lens”. Institute for Philosophical Research 50,000.00 17 2018-09-07 AI safety https://web.archive.org/web/20180921215949/http://existence.org/organization-grants/ -- General support. Announced at http://existence.org/2018/09/18/activity-update-july-and-august-2018.html. 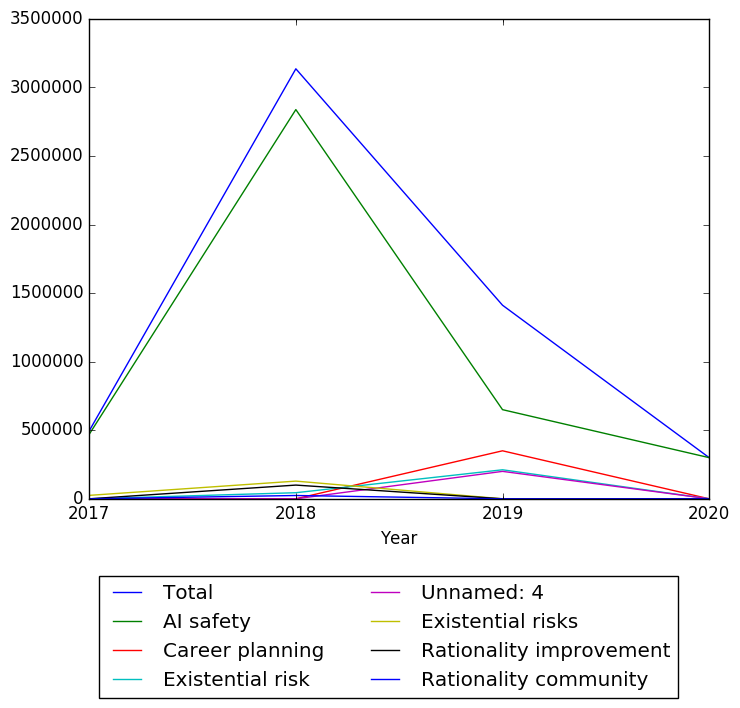 LessWrong 2.0 150,000.00 6 2018-09-04 AI safety https://web.archive.org/web/20180921215949/http://existence.org/organization-grants/ -- Given via the Center for Applied Rationality. To support the development of LessWrong 2.0. Announced at http://existence.org/2018/09/18/activity-update-july-and-august-2018.html. Center for Applied Rationality 300,000.00 3 2018-07-24 AI safety https://web.archive.org/web/20180921215949/http://existence.org/organization-grants/ -- General support. Announced at http://existence.org/2018/09/18/activity-update-july-and-august-2018.html and at http://www.rationality.org/resources/updates/2018/august-newsletter (CFAR lists $600,000 over two years as the amount). UC Berkeley Foundation 400,000.00 2 2018-07-24 AI safety https://web.archive.org/web/20180921215949/http://existence.org/organization-grants/ -- Intended to support Andrew Critch’s work at the Center for Human-compatible AI. Announced at http://existence.org/2018/09/18/activity-update-july-and-august-2018.html. Theiss Research 50,000.00 17 2018-07-12 AI safety https://web.archive.org/web/20180921215949/http://existence.org/organization-grants/ -- Intended to support Carrick Flynn’s research with Allan DaFoe at the Future of Humanity Institute. Announced at http://existence.org/2018/09/18/activity-update-july-and-august-2018.html. Future of Life Institute 300,000.00 3 2018-04-10 AI safety https://web.archive.org/web/20180905034853/http://existence.org/organization-grants/ https://web.archive.org/web/20180921215949/http://existence.org/organization-grants/ -- General support. Cambridge in America 200,000.00 5 2018-04-06 AI safety https://web.archive.org/web/20180921215949/http://existence.org/organization-grants/ -- For the support of the Centre for the Study of Existential Risk. Association for the Advancement of Artificial Intelligence 5,000.00 34 2018-03-30 AI safety https://web.archive.org/web/20180731180958/http://existence.org:80/grants https://web.archive.org/web/20180921215949/http://existence.org/organization-grants/ -- Grant in support of the 2018 Spring Symposium on AI and Society: Ethics, Safety and Trustworthiness in Intelligent Agents. See announcement at http://existence.org/2018/04/07/activity-update-february-and-march-2018.html. 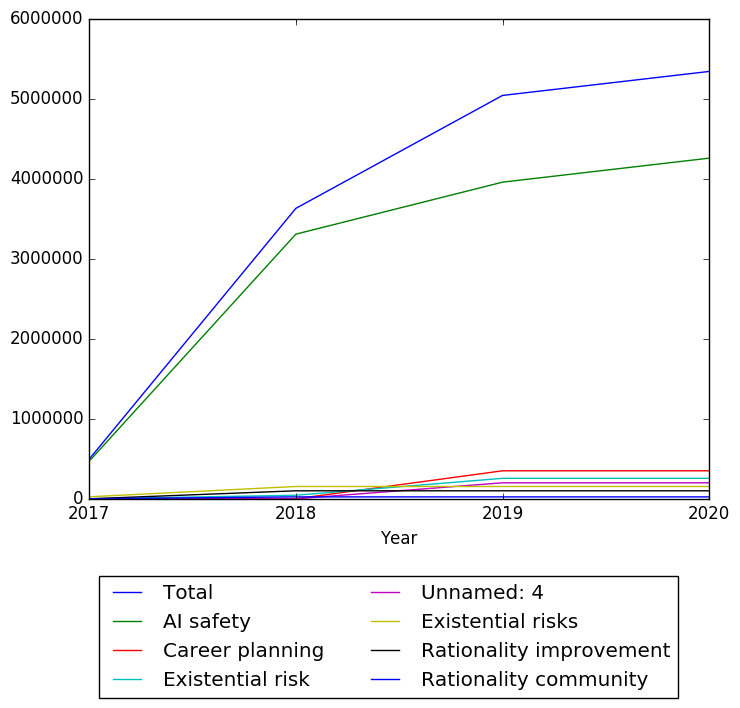 LessWrong 2.0 100,000.00 8 2018-02-08 Rationality improvement https://web.archive.org/web/20180731180958/http://existence.org:80/grants -- Grant via the Center for Applied Rationality for the support of activities to develop and improve the website LessWrong 2.0. See announcement at http://existence.org/2018/04/07/activity-update-february-and-march-2018.html. Center for Applied Rationality 800,000.00 1 2018-01-26 AI safety https://web.archive.org/web/20180731180958/http://existence.org:80/grants https://web.archive.org/web/20180921215949/http://existence.org/organization-grants/ -- General support for the purpose of a permanent venue for CFAR workshops. See announcement at http://existence.org/2018/02/08/activity-update-january-2018.html. Social and Environmental Entrepreneurs 25,000.00 23 2018-01-24 Existential risks https://web.archive.org/web/20180731180958/http://existence.org:80/grants https://web.archive.org/web/20180921215949/http://existence.org/organization-grants/ -- For general support of the Global Catastrophic Risk Institute. Machine Intelligence Research Institute 100,000.00 8 2017-12-28 AI safety https://web.archive.org/web/20180731180958/http://existence.org:80/grants https://web.archive.org/web/20180921215949/http://existence.org/organization-grants/ -- See blog announcement at http://existence.org/2018/01/11/activity-update-december-2017.html. Center for Applied Rationality 100,000.00 8 2017-12-27 AI safety https://web.archive.org/web/20180731180958/http://existence.org:80/grants https://web.archive.org/web/20180921215949/http://existence.org/organization-grants/ -- See announcement at http://existence.org/2018/01/11/activity-update-december-2017.html. Association for the Advancement of Artificial Intelligence 20,000.00 29 2017-12-18 AI safety https://web.archive.org/web/20180731180958/http://existence.org:80/grants https://web.archive.org/web/20180921215949/http://existence.org/organization-grants/ -- To support the conference on Artificial Intelligence, Ethics, and Society. See announcement at http://existence.org/2017/12/01/activity-update-november-2017.html. Future of Life Institute 50,000.00 17 2017-10-27 AI safety https://web.archive.org/web/20180731180958/http://existence.org:80/grants https://web.archive.org/web/20180921215949/http://existence.org/organization-grants/ -- For general support. See announcement at http://existence.org/2017/11/03/activity-update-october-2017.html.